I am an Inspired Edupunk…:D Are You? Basically Edupunk open’s the door to experiment through technology and gives us the ability to figure out what best works for us and perhaps our students. 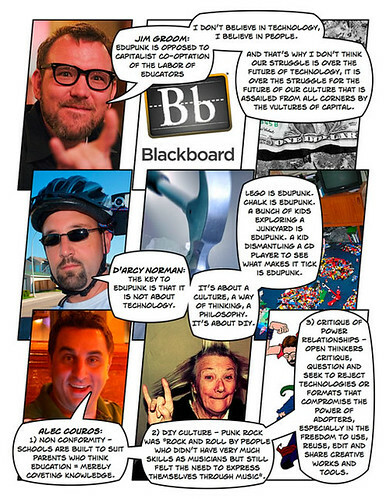 Edupunk, in my view is a struggle to advance along with technology. Edupunk opens us to go beyond the thought that we can only learn in school. No, this is not the only way, we have to take advantage and enhance through the DIY process. What I mean by this is, if I don’t understand something in class I would take it upon myself to understand what I don’t understand better. This blog of Tiffinianne is an example of the impact on Edupunk in our society, it was an inspiration to me. I believe Edupunk is a better way to help gain the interest of students in institutions. This makes me wonder if we install Edupunk in institutions will there be less drop out’s? I mean if students are given an opportunity to figure out things on their own this will challenge their thinking and motivate curiosity to adventure in order to learn. Students can figure out and do things the way the enjoy doing it, in this case learning it the way are able to understand. Often students find school to dull which takes away from their interest in learning. 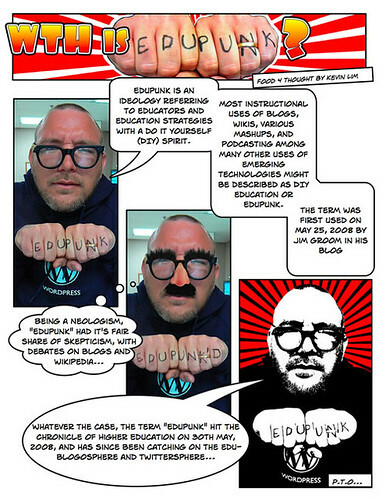 Edupunk is a way to grow better understanding and share knowledge to help others who may be struggling to understand. Edupunk teaches us to rely on ourselves through doing it on our own. This is going to be a great learning process! This entry was posted in EdTech DEW Lines, Edupunk and DIY Education and tagged Edupunk: DIY Education by Nasrin. Bookmark the permalink.